How do adults with dyslexia navigate the non-dyslexic world? An investigation into the coping strategies used by dyslexic adults from a community education centre. This is the title of a Masters research project carried out with a group of dyslexic adults in a Manchester community education centre. 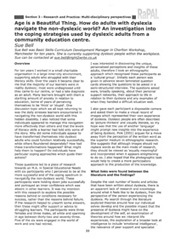 Opposite is a link to an article, published in the journal RaPAL (Research and Practice in Adult Literacy), summer 2009, giving a summary of the project and its findings. The next page shows you some photographs and words from this project.